What’s the Matter with the United Nations? On January 12, 2010, the deadliest earthquake in the history of the Western Hemisphere struck the nation least prepared to handle one. Jonathan Myerson Katz, the only full-time American news correspondent in Haiti, was inside his house when it buckled along with hundreds of thousands of others. In his visceral first-hand account, The Big Truck That Went By, Katz takes readers inside the terror of that day, the devastation visited on ordinary Haitians, and through the monumental—yet misbegotten—rescue effort that followed. As the Associated Press chief correspondent in Haiti, he was first to internationally report the catastrophic 7.0 earthquake that struck outside Port-au-Prince, Haiti, killing an estimated 100,000 to 316,000 people; he then stayed to cover the aftermath and flawed recovery that followed. That fall he broke the story that the United Nations likely caused—and was covering up its role in—a postquake cholera epidemic that killed thousands more. Katz is now a freelance journalist covering international and domestic affairs. 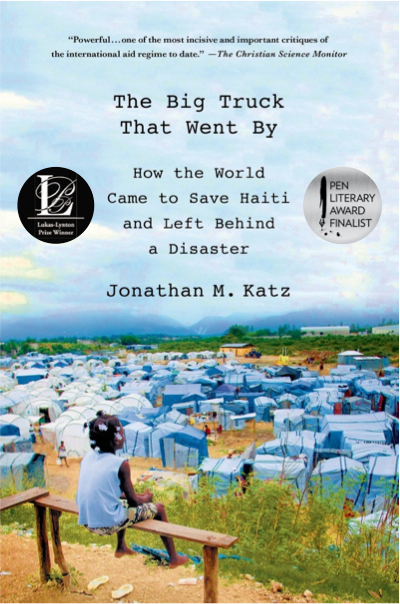 The Big Truck That Went By: How the World Came to Save Haiti and Left Behind a Disaster (St. Martin’s, 2013) was shortlisted for the biennial PEN/John Kenneth Galbraith Award for Nonfiction and won the Overseas Press Club of America’s Cornelius Ryan Award for the year’s best book on international affairs. 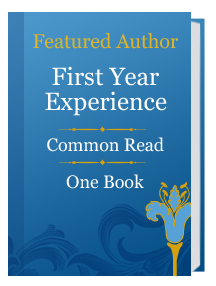 It was named a best book of the year by Kirkus Reviews, Amazon.com, Slate and the Christian Science Monitor, and selected for Barnes & Noble’s Discover Great New Writers program. In 2013, renowned Haitian-American author and MacArthur fellow Edwidge Danticat recommended The Big Truck That Went By to the New York Times Sunday Book Review as one of the best books written about Haiti. St. Martin’s will publish Katz’s next book, Gangsters Of Capitalism. As in the tradition of Tony Horwitz, it’s a journey tracing the forgotten wars and surprising legacies of the first great age of American empire, told in part through a lost antihero of the age, a marine who—like a tattooed Zelig or foul-mouthed Forrest Gump—was part of every major American conflict from the Spanish-American War until the eve of Pearl Harbor. Katz then went overseas. In seven years as a foreign correspondent with the Associated Press, he reported from more than a dozen countries and territories, primarily in Latin America and the Caribbean, along with stints in China and as an editor in New York. For his reporting on the Haiti earthquake and its aftermath, Katz was awarded the prestigious Medill Medal for Courage in Journalism (now the James Foley/Medill Medal). Other journalism honors include the National Headliners Award, two finalist nods from the Livingston Award for Young Journalists and finalist recognition from the Michael Kelly Award for the “fearless pursuit and expression of truth.” He was later named one of Diplomatic Courier Magazine’s Top 99 Foreign Policy Leaders Under 33. He is now a regular New York Times contributor. His recent coverage includes police shootings and the murder of three Muslim students in Chapel Hill, NC, as well as international features on migration, public health and disaster journalism for the New York Times Magazine. He authored a widely lauded series of articles from the 2015 UN climate change summit in Paris for the New Republic. Other work has been featured in Foreign Policy, Politico Magazine, The Atlantic, Pacific Standard, and the New Yorker online, among other publications, with grants from the Pulitzer Center on Crisis Reporting. Katz is currently the writer in residence at Duke University’s John Hope Franklin Humanities Center. He is a frequent guest on television and radio. Jonathan M. Katz was the Associated Press correspondent in Haiti from 2007 to 2011. The only full-time U.S. news reporter there during the quake, he later broke the story that United Nations soldiers likely caused a post-quake cholera epidemic that killed thousands. Katz has reported from more than a dozen countries and territories. In 2011, he was awarded the Medill Medal for Courage in Journalism. Published to glowing reviews and awards, The Big Truck That Went By is a crucial, timely look at a signal failure of international aid. Jonathan M. Katz was the only full-time American news correspondent in Haiti on January 12, 2010, when the deadliest earthquake in the history of the Western Hemisphere struck the island nation. In this visceral first-hand account, Katz takes readers inside the terror of that day, the devastation visited on ordinary Haitians, and through the monumental–yet misbegotten–rescue effort that followed. More than half of American adults gave money for Haiti, part of a global response totaling $16.3 billion in pledges. But four years later the effort has foundered. Its most important promises-to rebuild safer cities, alleviate severe poverty, and strengthen Haiti to face future disasters-remain unfulfilled. How did so much generosity amount to so little? What went wrong? In what a Miami Herald Op-Ed called “the most important written work to emerge from the rubble,” Katz follows the money to uncover startling truths about how good intentions go wrong, and what can be done to make aid “smarter.” Reporting alongside Bill Clinton, Wyclef Jean, Sean Penn, and Haiti’s leaders and people, Katz creates a complex, darkly funny, and unexpected portrait of one of the world’s most fascinating countries. The Big Truck That Went By is not only a definitive account of Haiti’s earthquake, but of the world we live in today. “Why Haiti?” Hillary Rodham Clinton asked in early 2010, speaking on behalf of a bewildered world. The earthquake that leveled Port-au-Prince and much of southern Haiti had defied logic, imagination, even superstition. How did a magnitude 7.0 temblor—a huge release of energy, but not necessarily catastrophic—prove to be the deadliest natural disaster ever recorded in the Western Hemisphere? Why did an earthquake, of all calamities, strike at the heart of a nation already reeling from so many others? And why, three years after so many countries and ordinary people sent money and help, hasn’t Haiti gotten better? I wrote this book in part to answer those questions. When the earthquake struck, I had been living in Haiti for two and a half years. I had already seen a lifetime’s worth of disasters, both political and natural. Two centuries of turmoil and foreign meddling had left a Haitian state so anemic it couldn’t even count how many citizens it had. Millions were packed in and around the nation’s capital, living in poorly made buildings stacked atop a fault line. People could not rely on police, a fire department, or schools. Even the rat-infested General Hospital charged so much for basic medicine that few Haitians could afford care. Nearly everything—water, gas for generators, hungry relatives from the countryside—was delivered by truck. Each day, big eighteen-wheelers rumbled down the narrow streets, shaking homes as they passed. When the shockwave surged through Port-au-Prince, just fifteen miles from the epicenter, many of us thought at first that it was a gwo machin, a big truck, going by. I wanted to understand how people could endure not only the catastrophe that befell Haiti on January 12, 2010, but also the hardship and absurdity that followed.